MOVING PICTURES: I Am The LAW! Marvin Law is a talented Toronto artist and writer, whose outgoing personality and bombastic drawing style have made him a fan favorite in artist’s alley on the convention circuit. 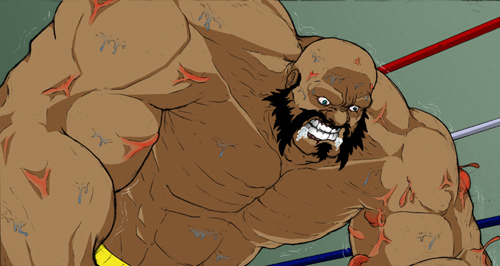 Marvin tells us about his Webcomic, SLAM, and offers his views on the future of comics. You've been very committed to SLAM, Marvin. How long have you been working on it, and how often do you update (or try to update) the strip? I try my best to update it once a week, usually on a Tuesday, so it will be available for readers on a Wednesday. I'd say I was working SLAM on and off for about 2 years. Some would say, that's a long time to be working on a project, but for me SLAM was a labour of love that I couldn't resist, since I'm a big fan of professional wrestling, and action filled comic books. So, I got the chance to write and draw a story that I created, and that was really satisfying. How long do you expect to continue creating new pages for SLAM? For this arc, there is a definite ending to the current SLAM storyline, once issue#3 wraps itself up by page 26. However, with that said, I do have 2 very different ideas for possible sequels to SLAM, if reader demand is there, but we'll see how it goes. I've got lots of projects on my plate at the moment, that I want readers to be able to enjoy, which are quite different and unique from the concept of SLAM. Have you tracked the traffic on the SLAM site? How are you doing? I do keep track of the traffic coming to the SLAM Webcomic, and last week after the update, we had about 50 unique visitors come to the page and we had about 300+ page views. For those who aren't familiar with SLAM, give us the basic rundown on what it's all about. SLAM takes place in a world, where professional wrestling is as real a sport, as MMA (Mixed Martial Arts) is to us. 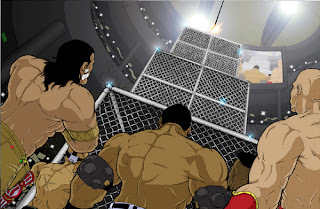 The story opens up with an incident at the NFW Arena, where one of the wrestlers is injured critically during a match, however the wrestler is later on found to be perfectly fine. This sets off the chain of events to find out what's been happening to the wrestlers. Obviously, you're a wrestling fan. I find the choice of genre interesting though, because it has a lot in common with superhero comics. Was that just a by-product of wanting to do a wrestling strip, or did you make the choice more deliberately? It's actually, a little bit of column A and a bit of column B. 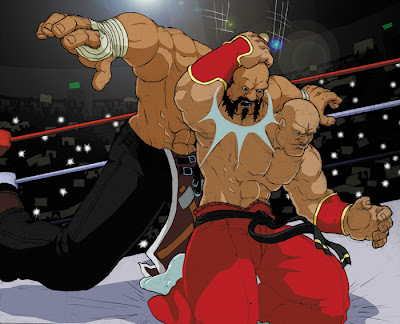 Like you said, I'm a big wrestling fan, and here was a chance to combine the wrestling moves and clichés with over the top fight scenes from superhero comics. Plus, for some odd reason, a lot of comic book fans have a tendency to look down their nose at wrestling and think it's beneath them, and I don't understand that. The story is basically the same, good vs. evil and in terms of special moves, a Stone Cold Stunner is no different from an optic blast in my mind, but that's just me. I love the running commentary you have at the bottom of each page. You really prod the reader with questions and foreshadowing. Was that always part of the plan, or did that just happen when you started posting the strip? To be honest, it just happened after I set up the webcomic, due to the fact that I felt the bottom of the page was empty and I wanted to keep the fans thinking about the next installment, of the SLAM Webcomic. As for the foreshadowing part, I'd usually offer up one phony possible outcome, as an attempt to swerve the readers, so when the real event actually happened, it would be so shocking to them, based on the statement I made previously. It’s an effective technique, almost like an announcer on a wrestling show trying to drum up interest. I really enjoy reading them. Tell us about the other people who work on the strip. I see that Kristopher Feric has an "editor" credit, what does he do by way of editing the strip? Kristopher Feric's role as an editor corresponds with his lettering credit. When he's lettering the SLAM Webcomic, he has the authority to alter/change the dialogue from my script, if he feels he can make it read smoother and express my ideas, in a simpler fashion, so that the captions and word balloons don't cover up the artwork and he helps to help smooth over my grammar and spelling. Tell us a bit about the colorist, David McConnehey. Awwww, where to start on David McConnehey. 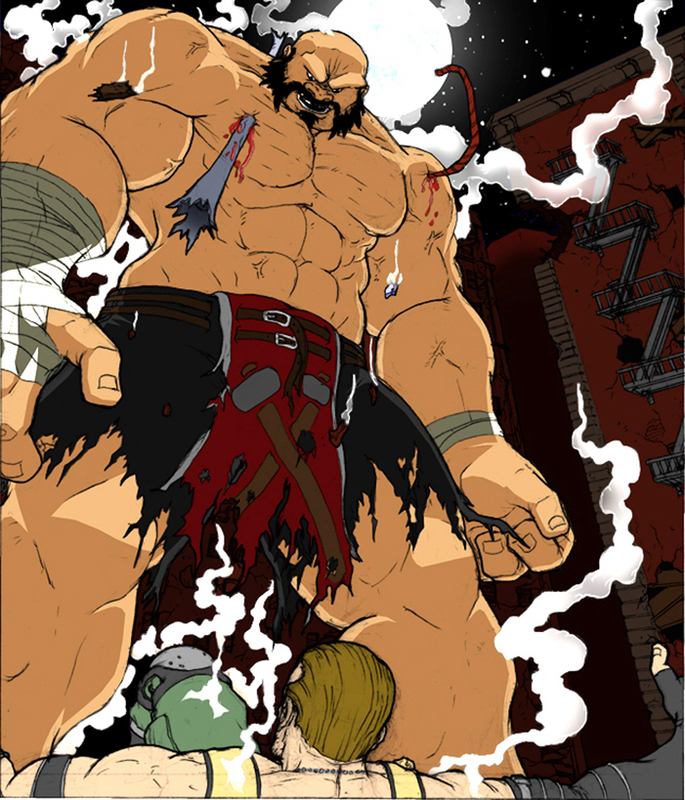 He's a nice young man that I discovered on DeviantArt, when I put an open call out for a colourist for SLAM. And, sadly for David, he sent his work in, and I thoroughly enjoyed his beautiful work and determination. So, since that time, poor David has been stuck listening to my crazy instructions for the last 2 years, and getting pages coloured up beautifully, in spite of my instructions. Have you managed to monetize the site at all, and how successfully? To be honest, I haven't monetized the SLAM Webcomic, at this point. It's been mainly used as a marketing tool, to help build a fan/readership base, in case I ever wanted to turn the SLAM Webcomic, into a hard copy form, whether it be through actual individual floppy issues or as a collected graphic novel. Other than that, I've been able to use the website, as a means of communicating and expressing my own personal views on professional wrestling. Personally, as a comic book traditionalist/purist, I like to think that there can be a balance, between comic books on the web, and in the printed format. However, with the advent of the digital readers and tablets, I'm sure it will allow more readers to discover and enjoy comics in a whole new digital form. But for me, to this very day, there's nothing like holding a hardcopy of a comic book or a graphic novel, turning the page physically and being able to look over the art, as closely as possible. I understand you are about to publish a graphic novel collection of the strip. When will that be available, and where? 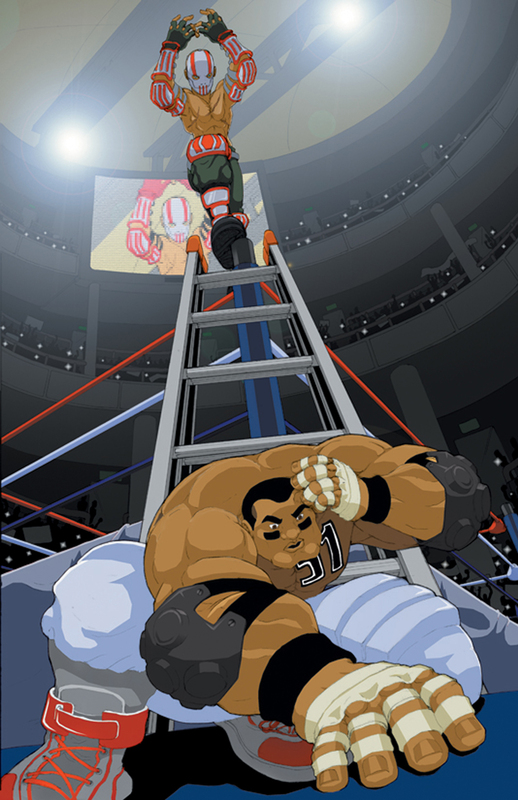 If all things go according to plan, I'm expecting the SLAM Graphic Novel to be available for August, in time for the FanExpo show in Toronto. I'll be selling the SLAM Graphic Novel at my table, and for any retailers, you should be able to order the SLAM Graphic Novel from the ComicsMonkey Distribution system/catalogue. I see you're using Kickstarter to raise money for the GN. Tell us a bit about that, and the Kickstarter site. Also, are you relying just on that for funding, or is there a plan "B"? Guess the first place to start off, is to explain what Kickstarter is. Kickstarter is an all or nothing project funding by the community, whereby project creators offer up unique and special rewards to potential backers. They pitch a variety of projects ranging from comics, films, games, music and many more. It was an attempt on my part to offset the cost of printing up a 100 page full-colour graphic novel, and to offer fans the opportunity to pre-order their own copy of the SLAM Graphic Novel. There are some very cool rewards available, (if you don't want a copy of the SLAM Graphic Novel), in the form of original artwork that you can purchase, as well. It would nice to get full funding for the SLAM Graphic Novel from Kickstarter, but there is a plan B, in place in case we're not able to gather our funding. The printer that I have in mind has their own independent distribution system and offers up print on demand for potential publishers. Good luck with everything, Marvin, and thanks for the interview.